My motorcycling career has spanned about 45 years�so far. For the first 30 or so years I didn't wear any hearing protection. I figured that being a big, tough biker involved a bit of pain and suffering here and there. Getting battered by sun, grit and wind was just part of riding a motorcycle. Of course, back in my early days of riding no one was paying much attention to noise exposure. If you worked in a steel mill, gravel crushing plant or on the Boeing flight line, you just learned to ignore the noise and assumed you'd be wearing a hearing aid later in life. But as more and more hearing loss claims started hitting businesses in the corporate wallet, researchers began to look into noise, and eventually the federal government Occupational Safety and Health Administration (OSHA) developed some rules about on-the-job noise exposure. Although OSHA doesn't say anything about recreational pursuits like motorcycling, it's obvious to me that the noise rules are applicable to motorcyclists. Once I understood what was happening about 10 years ago, I started wearing earplugs, and these days I wear them on every ride. If you aren't wearing hearing protection when you're riding, you need to hang with us as we take a quick ride through Earplugs 101. You might think that the primary noise culprits would be loud pipes or diesel turbos, but it turns out that the major culprit is wind noise. Wind noise around a rider's head is very loud, but at a low frequency that fools the brain into thinking it's not as bad as it really is. Noise is measured in decibels, or "dB" and there are various scales for measuring dBs. The scale for human hearing is "A." So, for measuring noise as it affects the human ear, the level is measured as "dB(A)". 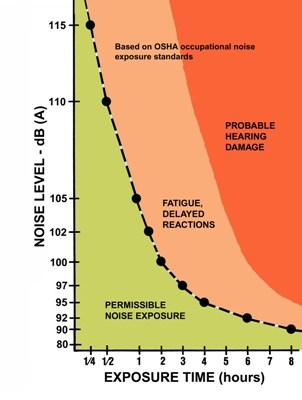 OSHA has determined that hearing damage occurs as a combination of noise level and exposure time. You can tolerate a very loud noise (say a jackhammer) for a short duration, or a modest noise (say the inside of an airplane) for many hours. If you listen to a loud noise (say a wood router) for a long duration (6 hours) you will have some hearing damage. 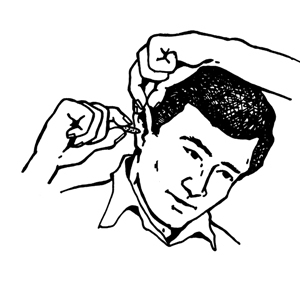 If you're curious about your hearing, you can get tests at an audioligist's lab. To understand what sort of "damage" we're talking about, it might be helpful to understand how hearing works. Sound is transmitted in waves of air pressure. The sound waves are directed up the ear canal by those big skin funnels. When the waves bump into the eardrum, the movement is amplified by a clever connection of bones in the Middle Ear called "Ossicles." The Ossicles transmit the pulses to a snail-shaped tube in the Inner Ear, called a Cochlea. The Cochlea is lined with tiny receptor hairs, and it's filled with a hydraulic fluid to damp the pressure waves. The tiny receptor hairs provide electrical impulses to the Auditory Nerves, and the brain comprehends the impulses as sound. If the sound pulses transmitted to the Cochlea are very loud, the sudden pressure can break off the receptor hair one by one, gradually diminishing hearing. Repeated loud noises will gradually break off more and more receptor hairs. 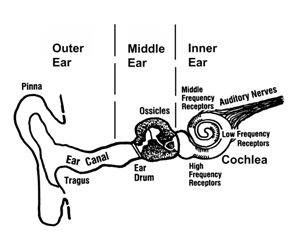 The position of the receptors in the Cochlea determines the frequency range. If there is constant high volume noise in a certain frequency range, you will gradually go deaf in that range. The problem is that the little receptor hairs in the Cochlea don't grow back. Once they snap off, they are just useless debris, like broken cylinder fins. And let's note that big, bad bikers don't have stronger Cochlea hairs than anyone else. Toughing out a noisy ride won't prevent hearing loss. It turns out that wind noise is at a low frequency�more like the rumble of a bass drum. The low frequency fools the brain into ignoring it, even while some of those little hearing receptors are getting snapped off. What's really insidious about wind noise is that the brain learns to ignore it, even as your hearing is being damaged. It doesn't hurt when a hearing receptor snaps off. How loud is wind noise? Tom Mehren and I had a chance to do some measuring with a sound meter stuck out of an open car window. We found that the noise level was around 100 dB(A) at speeds over about 50 mph. The noise didn't increase when we passed a noisy truck, and it decreased with the window rolled up, so we have to conclude that the loud source was mostly wind noise. Our measurements agreed with what the noise researchers have found. Tom's meter didn't give us the option of measuring frequency. But some researchers in England carefully measured wind level, and determined that wind noise is very loud at low frequencies, drops off steadily after about 250 cycles per second ("Hz") and goes quiet by about 6000 Hz. OK, we have to believe that wind noise is potentially damaging. But do I have to wear hearing protection while riding around town, or for a half-hour run on the freeway? 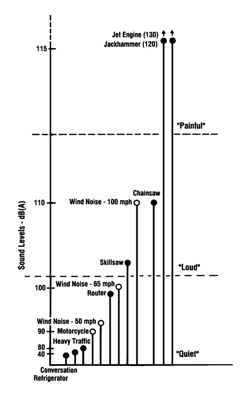 OSHA considers noise level and exposure time, and has a chart that applies to motorcycling as much as to industrial jobs. No, you don't have to wear earplugs at speeds under about 40 mph, even for several hours. And for speeds over 55 mph, you can tolerate up to about 2 hours and still be within OSHA limits. But if you're going to ride more than two hours at greater than about 55 mph, you'll need hearing protection to avoid damage. 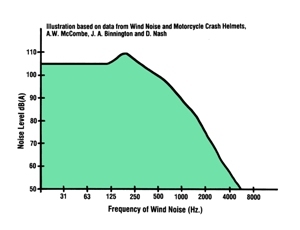 Doesn't a high priced helmet reduce wind noise? The shape of a helmet shell, and the smooth fit of a faceshield can reduce buffeting, but air is constantly moving around the helmet, and it generates noise. The noise doesn't necessarily travel in the same direction as the air. And some helmet components can actually generate noise. I'm skeptical of any advertizing claims about a helmet being "quiet." I have yet to see any noise testing of helmets that proves any attenuation in the wind noise frequencies. With that background in how wind around your helmet relates to hearing damage, stay tuned for Part 2, where we'll discuss the different types of earplugs and how to use them.